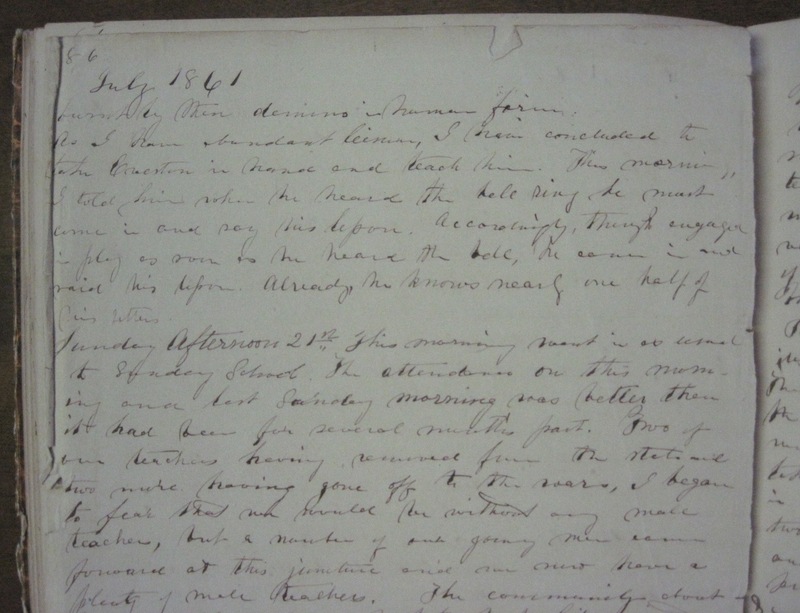 Item description: In this diary entry, Jesse Bernard expresses the pervasive talk of war surrounding the early months of the Civil War. He insists on God’s support of the southern cause given the Confederate’s smaller troop numbers and economic resources. He also demonizes Union forces for their attacks on southern property. Monday 15th. It seems that I am writing in my Journal more frequently than formerly. I shall be glad when I get through this book as it is so large I cannot keep it in a convenient place. Nothing is talked, written, spoken, and almost, preached about but the war. We have now war in earnest. Nearly every day life is lost in skirmishes. So far no important battle has taken place though it is rumored that Patterson and Cadwallader at the head of 32000 men were repulsed three times by the forces under Johnson, our General, amounting to 15000. This report reached us a week ago, but as yet we have received no confirmation all are agreed however, that a great battle will take place very soon. Lincoln in his message calls for 400000 men and a loan of $400000000! This looks like he intends to prosecute the war with vigour. Though numbers and wealth are opposed to us, I have a firm reliance on the God of battles, that all will be well. He knows our cause is just and will answer the cry of his people. The acts of these vandals of Lincoln in the border states where they have gained a foothold would make a barbarian blush. If a man is known to be a secessionist, his life is unsafe and his property destroyed. Splendid mansions, magnificently furnished have been ruthlessly burned by these demons in human form. As I have abundant leisure, I have concluded to take Overton in hand and teach him. This morning I told him when he heard the bell ring he must come in and say his lesson. Accordingly, though engaged in play as soon as he heard the bell, he came in and said his lesson. Already he knows nearly one half of his letters. 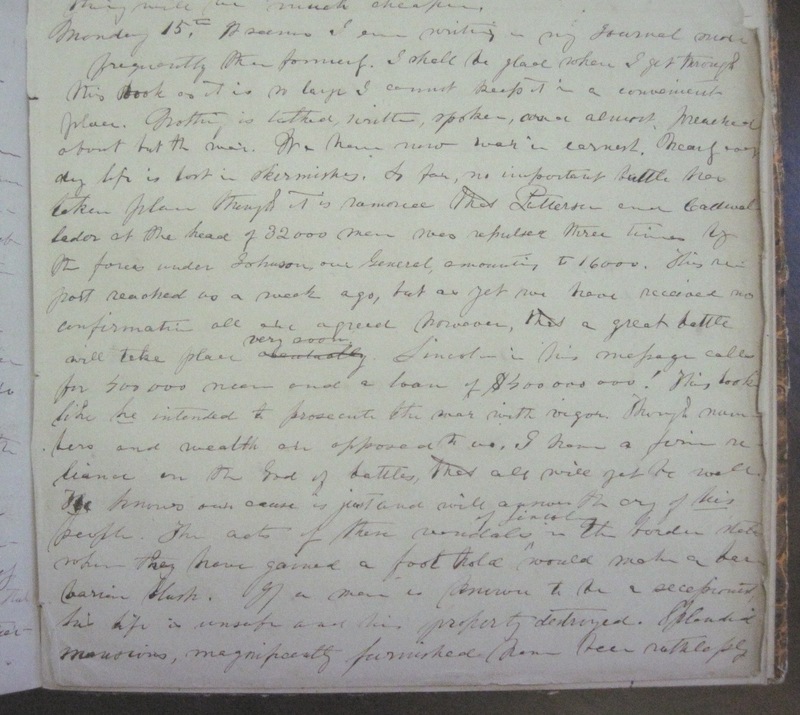 This entry was posted in Southern Historical Collection and tagged Abraham Lincoln, conscription, Jesse Bernard. Bookmark the permalink.